To all my favorite songs. I love to hear those voices talk in rhymes. So much going on in this photo along with the music in my head! and be sure to pick this “I’m Ready” sweeeeeeeeet pose up for yourself! for running around in jeans or with fantasy styles! show off these hippy bell-bottoms by Pixicat! So now I think I’ll just jump up and dance in room…. ~ (Fair Play July, but now available in Main Shop) ~ MFGC! Coco Animal Fox Clutch Glitter RARE ~ u.f.o. a dress or suit to create a bit more of a wild appeal? a fun addition for my photo! Love the texture HUD she created, too! So today, I was a bit WILD ABOUT ZEBRA WHATSIS’! 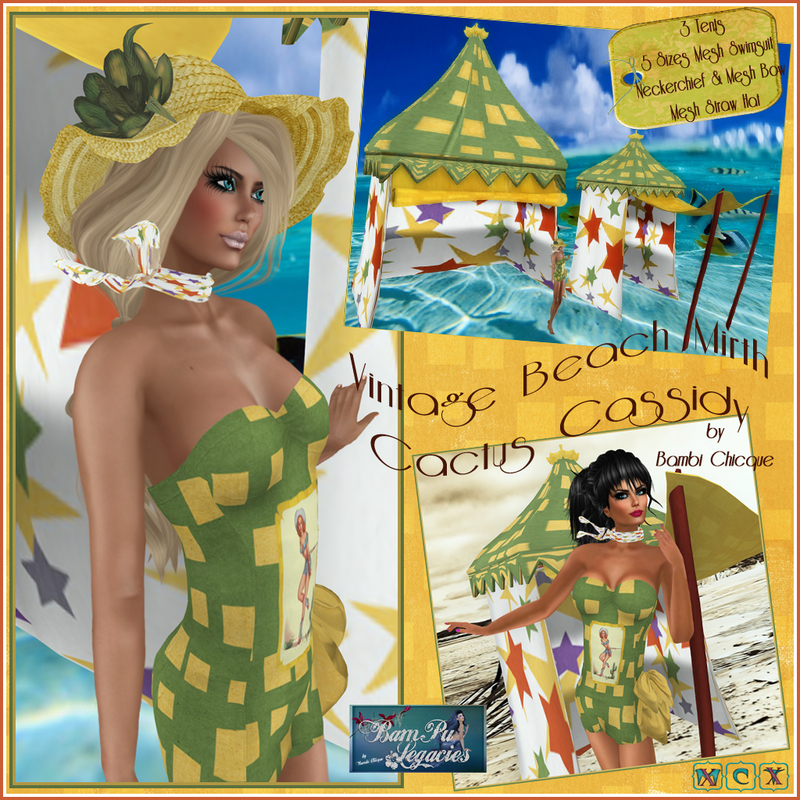 Vintage Beach Mirth ~ New Sets Out Now! R U LOOKING AT MY BEACH BALLS? for crisp and clear details! as per losta’ requests so far! Sooooooooooo….back to my BamPu Legacies Building Box for now…. and LOADS OF LINDEN FLYING! I know Shiran was more than delighted with all the donations and wins for the SPARC BENEFIT! She set the theme for the event as RETRO FLAPPER DAYS and the music was “gala to our ears”! LouLou successfully won the bid for my “Vintage Beach Mirth TWO MOON Set”. Vica was thrilled when she won the bid for my “Vintage Beach Mirth TWO MOON Set”. She told me she couldn’t wait to wear it and set out the tents! And yes, he won the bid for the “When We First Met Gazebo Set”! He jumped his bid up quite high to ensure his win! Vian and I opted to wear a couple of the retro swimsuits to show them off so everyone could see the detail in style and textures that I created for these sets. As I was working on the photographs, I just noticed I forgot to send Vian the coordinating hat to wear! Oh well, she always grabs up every design I create and I’m sure I will see her today sporting one of these sets! 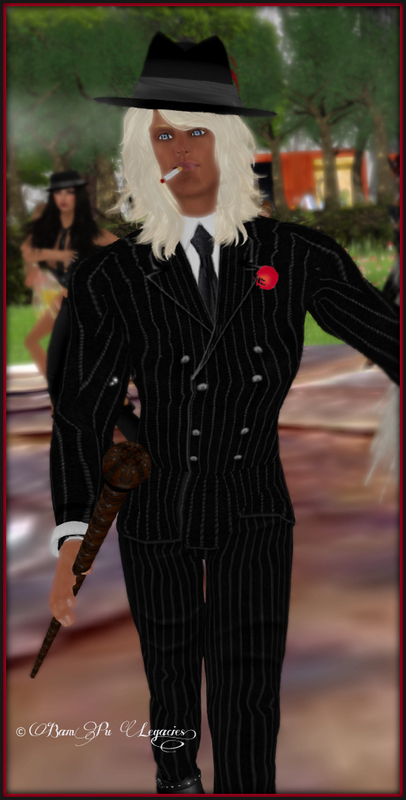 Argus is always absolutely dressed to kill ~ don’t cha think? ….oooh I have to jump in for that! and the dancing flowed perfectly to the music our DJ selected! I have already been asked when the full sets will be out for sale in my BamPu Legacies Shop. I plan to add them today…!! I added the medium and large tents as well as included the coordinating floppy straw hats! These will be copy ok versions ~vs~ the transfer only in the GACHA game. Don’t forget, they will be continuing this event through today as well! Theme: FISHING! ~ Yes relaxed style and comfy! later today to see the new items I will be adding today!